This creamy recipe uses our fat free Carnation Condensed Milk Light - and served with the fruit makes a lovely light tasting dessert. Place the Carnation Condensed Milk Light and crème fraîche in a mixing bowl and whisk together, gradually whisk in the zest and juice of the lemons, orange juice and orange flower water if using. To serve, loosen the panna cotta by dipping briefly in hot water before turning on to a plate. 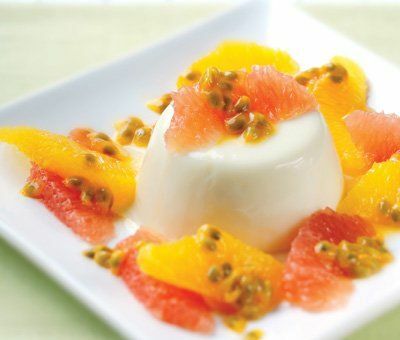 Decorate with the grapefruit and orange segments and spoonfuls of passion fruit seeds.